Geo-Solutions was contracted by The City of Irving, Texas to install a Soil Mixing Barrier Wall that tied into the existing slurry walls at the Hunter Ferrell Landfill. The soil-mix barrier wall was overlapped into the existing slurry walls on the Middle Tract and East Tract cells. 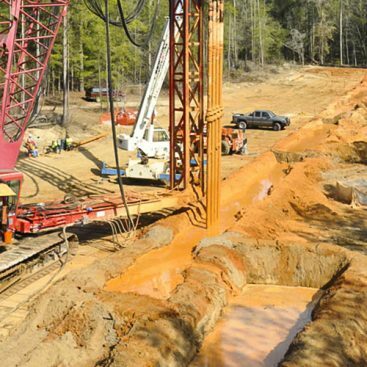 The site conditions, including unstable/flowable sand, made it necessary to install this section of the barrier wall using soil mixing, where traditional slurry trenching was not possible. The barrier wall was installed to complete the seepage barrier along the south side of the future Middle Tract of the landfill. Additional scope of work on the site included berm construction over the barrier wall alignment. This berm was built for 25-year flood prevention. The length of this soil mixing wall was 744 linear feet with an average depth of 45 feet for a total of 8427 vertical square feet. The average depth to top of shale key-in layer was 40 feet. 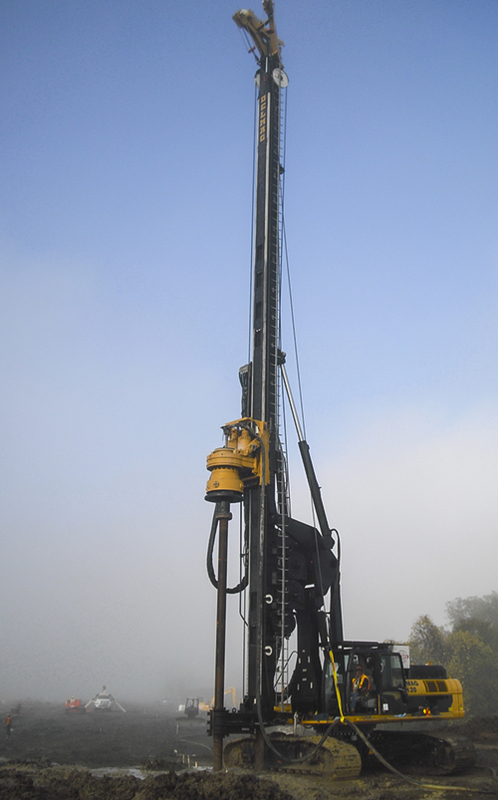 The Barrier Wall was mixed with a Delmag RH20 Drill Rig with a 4-ft diameter soil mixing auger attached. The overlapping 4ft. diameter columns provided a minimum 36” thick wall. 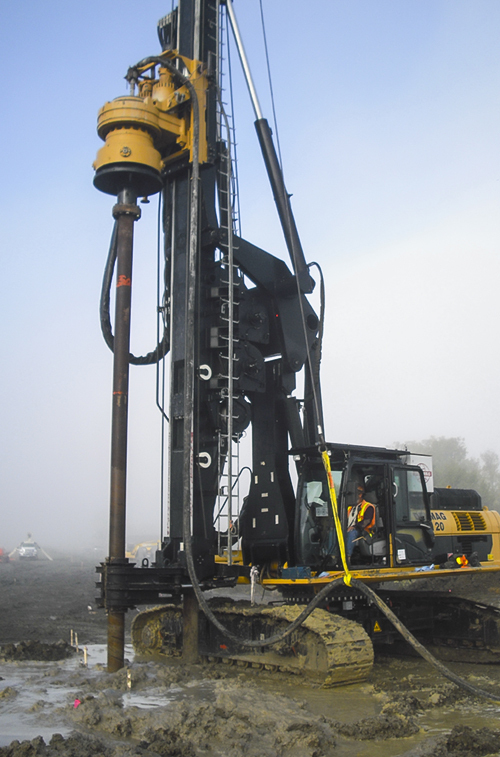 Geo-Solutions keyed into the underlying shale layer approximately 6 feet and no less than 2 feet throughout production. 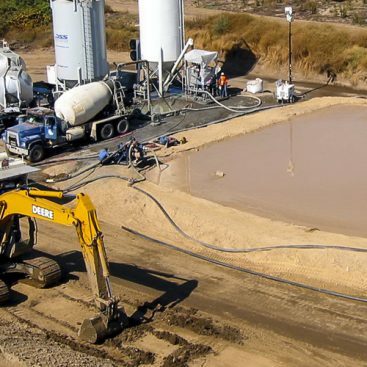 Slurried bentonite was used to create the soil mix material necessary to meet the permeability requirement of 1×10-7 cm/sec. 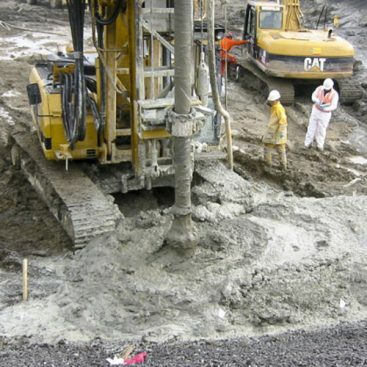 The slurried bentonite was pumped through the mixing tool while drilling and mixing the columns that created the continuous barrier wall. Geo-Solutions exceeded every permeability requirement on all samples sent to the lab, with an average permeability being 1.79×10-8. 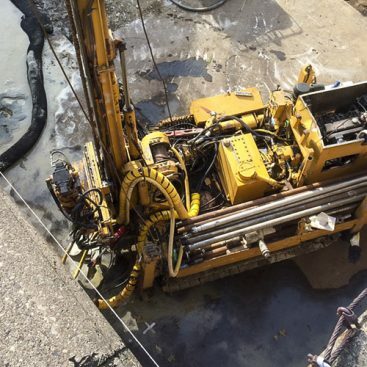 Field samples of the freshly mixed material were taken once a day from differing depths of a finished column using Geo-Solutions’ custom designed sampling device. Samples were tested for permeability at Geotechnics Laboratory in Pittsburgh, Pennsylvania. All other quality control tests were done on site by the Geo-Solutions Project Engineer. These tests included unit weight, viscosity, pH, and filtrate on the bentonite slurry. The significant challenge on the project was buried obstructions. These obstructions were encountered during the mixing of the wall and included boulders, timbers, and steel cables. The obstructions were removed from the alignment with an excavator so that all columns could be installed. Ambient air in work zone air-monitoring was also done on this site every one to two hours of production. This was done due to the potential for encountering buried trash at the site. The project was completed in Level D at all times.